As promised, Nendoroid Mikazuki Yozora from Boku wa Tomodachi ga Tsukunai is available for pre-order starting today. Apparently, she is scheduled for late January 2012 release with a price tag of 3500 Yen. The beautiful, yet heartless creator of the ‘Neighbor’s Club’! From the light novel series with an anime on the way – ‘Boku wa Tomodachi ga Sukunai’, comes a Nendoroid of the beautiful heroine with a very dislikable personality – Yozora Mikazuki! 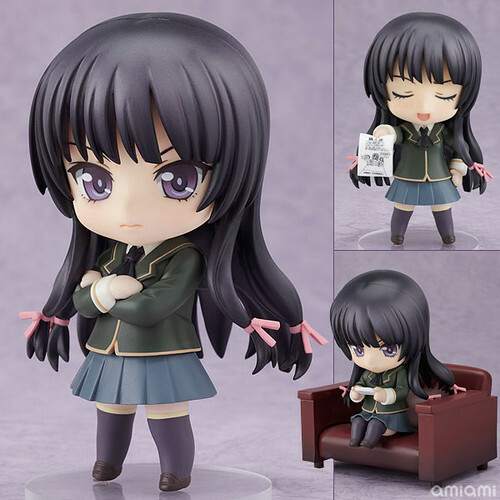 The Nendoroid captures Yozora’s unsociable and cranky image perfectly, but still has that cute Nendoroid appeal! She comes with three expressions in total – her standard cranky expression, a smug expression and even the smiling face that she only ever shows to her imaginary friend, Tomo-chan. She also comes with various other extra parts, such as a sofa and portable game console to recreate your favorite scenes from the Neighbor’s Club! This entry was posted in News and tagged boku wa tomodachi ga tsukunai, haganai, mikazuki yozora, nendoroid.